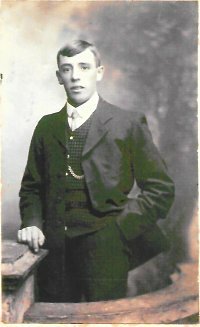 Herbert was born c.1887 the son of William and Ellen Roberts. His father, a linen packer was born in Plymouth and his mother in Launceston. Their five children, Ernest, Herbert, Harry, Sidney and Amy were all born in the London parish of St Luke. The 1891 census recorded that the family were living at 16H Block, Peasbody's Buildings, Roscoe Street, London. Ten years later, at the age of 14 Herbert and his elder brother Ernest were working as errand boys. In 1911 the family were still residing at the same address and Herbert was employed as a porter for a cloth manufacturer. On the 7th July, 1912 at St Mary Magdalene Church, Southwark, Herbert married Frances Elswood Daking. Subsequently they had two children and lived at 13 Fairbank Street, East Road, City Road, London. At the outbreak of the First World War, Herbert enlisted into the Army at Shoreditch. His regimental number, S/6673, the letter prefix indicating that he was a wartime enlistment. After training he was posted the 2nd Battalion, The Rifle Brigade, a regular Army battalion. Prior to the outbreak of war they had been stationed at Kuldana, India (now Pakistan) and upon mobilisation they travelled by train to Bombay. On the 18th September, 1914, they embarked on the S.S. Somalia and sailed two days later for the United Kingdom. Disembarking at Liverpool on the 22nd October the battalion entrained for Winchester where they joined the 25th Brigade part of the 8th Division. On the 6th November, the battalion arrived in France for deployment on the Western Front. Rifleman Herbert Roberts went to France, possibly as part of a reinforcement draft on the 19th May, 1915. Before leaving for overseas service Herbert arranged that a separation allowance was paid to his wife. A letter from the Army Pay Office at Winchester informed her that as from the 12th April, 1915 she would receive a weekly payment of £1 4s 6d for the two children and herself. In the Spring of 1916 the 2nd Battalion, The Rifle Brigade participated in offensive operations undertaking raids on German positions in the Thiepval-La Boiselle sector. On the 27th June they were relieved and given two days rest in bivouacs in Long Valley near Albert. Leaving there during the evening of the 29th the battalion began to move towards the front line. By the end of the following day they were in their final assembly trenches in readiness for the opening day of the Somme offensive. With the 2nd Battalion, Royal Berkshire Regiment, 2nd Battalion, Lincolnshire Regiment, 1st Battalion, Royal Irish Rifles in support, the 2nd Battalion, The Rifle Brigade were to attack Ovillers. The latter battalion were held in reserve, until 0730 hours when they moved up through communications trenches into the front line. Ordered to advance towards the German line the leading troops were subjected to concentrated artillery fire. Although some managed to reach the German front line they were forced to withdraw back to their own front line trench position where they had to endure further enemy shelling. After sustaining 134 casualties they were ordered back into the support trenches where they were relieved and returned to bivouacs in Long Valley. On the 6th July, they entrained for Bethune and occupied billets there until the 22nd and then took over positions in the Hohenzollern sector until mid-October. Throughout this period they suffered the rigours of trench warfare. They were given the task on the 25th-26th August to attack German positions in the Hulluch sector. Forward observers had determined that a British artillery bombardment had cut gaps in the German wire. At midnight three companies advanced under the cover of a barrage and within a few minutes reached the enemy wire. There however, the troops came under rifle-grenade, mortar and shell-fire from the German 2nd and 3rd line positions. The attacking troops did not come face to face with the enemy as they were not occupying the front line section which the 2nd Battalion, The Rifle Brigade attacked. In their advance the battalion sustained 131 casualties, including 26 killed. Among those posted as missing was S/6673 Rifleman Herbert George Roberts. His wife was notified that her husband had been posted as missing and any further information about Herbert would be communicated to her. With the 'fog of war' and the fate of many soldiers unknown, Frances was not alone waiting for news of their loved ones. "I saw a man named Roberts wounded in a raid at Vermelles about Sept. 26th. He was lying on the ground and seemed very bad as I crawled past him. It was dark but I am sure it was Roberts. He was a very slim built fair man, of about 30, and came from London, I heard nothing about him afterwards. He was not in my platoon." The following month a letter from the Ministry of Pensions informed Frances that the separation payment would cease on the 6th May, 1917. Instead she would receive a pension of 13s 9d and an allowance for the two children of 9s 2d. The weekly payment of £1 2s 11d paid through the Post Office at Hoxton commenced on the 9th May, 1917. This change of payment, the Ministry insisted did not indicate that there was any proof of her husband's death. Sadly for Frances and her children, Herbert's body was not recovered from the battlefield and his name is inscribed on Panel 129 of the Loos Memorial. He was 29 years of age although the CWGC list him as being four years older. 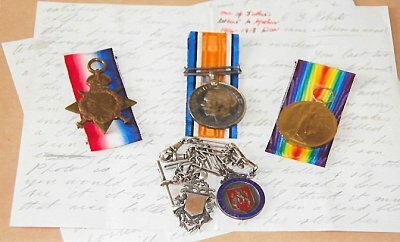 Frances would have received his campaign medals, the 1914-15 Star, British War Medal 1914-1918, Allied Victory Medal 1914-1919, Bronze Memorial Plaque and Commemorative Scroll. The group has been broken up and the whereabouts of the memorial plaque and scroll are unknown. [Sources ~ Original and copied documents and photograph of Rifleman H.G. Roberts. Ancestry ~ Census records for 1891; 1901 & 1911. War Record ~ 2nd Battalion, The Rifle Brigade.